Rain pounded on the roof through most of the night and continued through breakfast. Don was off to work on the mountain and we planned to go to farmers market and then do a bit of shop-hopping in downtown Hilo. We armed ourselves with umbrellas and shopping bags; Carol rolled up her pants legs—I should have too as we ended up wading through a lot of water in the market and crossing the streets. Farmers Market occupies a goodly portion of a block with an additional crafts/flowers market across the street. Although tarps covered the area and a few shop-owners had hung shower curtains to keep the rain out, there was still a lot of water –and as it was still raining—very noisey. 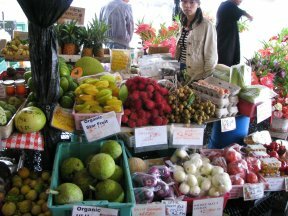 The fruits and vegetables were neatly displayed with bunches of green beans bundled with rubber bands; long eggplants, breadfruit, bananas, star-fruit, and a large variety of baked goods and prepared foods. Glen wanted an Aloha shirt—which we got at the local Salvation Army store, dried fish—at a kiosk in the mall, and watched two hula dancers who were performing as part of a fund raiser. Rain continued to pour—and we paddled our way back to the car—and went home to dry our umbrellas, have a lunch of treats from farmer’s market and a cup of tea.